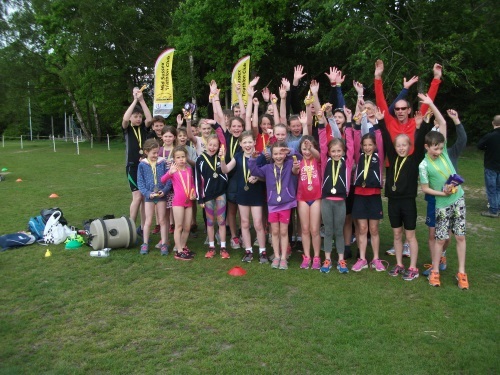 Many members and club coaches were at Great Walstead School's playing field and pool for the club's Junior Triathlon event on Sunday 15th May. About 25 juniors from 8 - 15 years participated in triathlons of varying lengths depending on their age. They were divided into 3 groups, each with a club coach, and had all received some training on previous weekends. The young ones did a 30metre swim, followed by a 700m bike ride and finished with a 700m run. The older ones did up to a 240m swim, a 2-3km bike ride and a 1.4km run. They received a full briefing and bike safety check before commencing. They were encouraged by many parents and grandparents, all cheering and ringing cow bells, which made it all very enjoyable, and much easier for the participants, leading to some excellent performances. 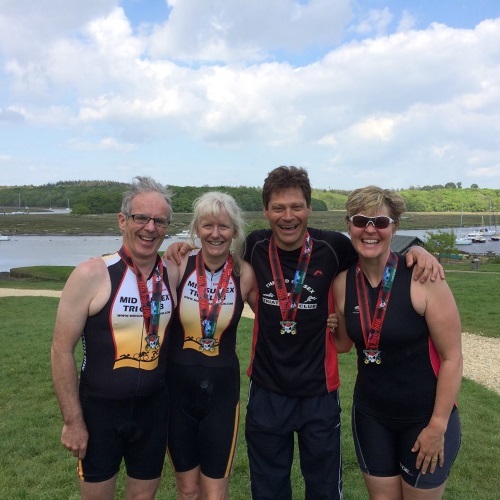 Four keen members participated in the Swashbuckler Middle Distance Triathlon event at Bucklers Hard in Hampshire on Saturday 15th May. This involves a 1.9km swim in the chilly (16 degrees) Beaulieu River, a 90km bike ride in the New Forest and a 22km run. All recorded personal bests in glorious sunshine, with Steve Alden coming first in his M55 category on 5.04.01. Brad Williams was 6th in the same category on 5.53.50 with his wife Julie Williams placing 3rd in the F50 category on 6.22.15 and Jean Fish placing 3rd in the F55 category on 6.38.28. 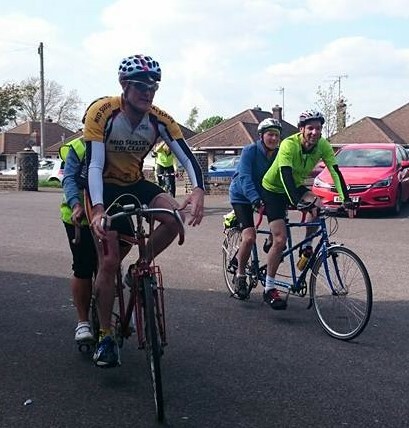 Steve McMenamin, Jo Fleming, Lawrence Wintergold and Paul Virgo helped out at the 4 Sight Charity 40 mile Bike Ride which started at The Thatched Inn, Hassocks on Sunday 15th May. This comprised of 14 tandems and 2 triplets where the back riders (stokers) are blind or severely visually impaired. The Mayor of Haywards Heath and the Charity's Chief Executive were on the triplets. This year's revived Horsted Keynes Triathlon brought out a great mixture of semi-pro athletes and first timers. It is these - slightly eccentric - events that are the breeding ground for our sport......and so it was proved to be at this year's event on Sunday 6th October. Beautiful crisp weather greeted the start of the event where Paul Hedger took the teams and individuals through the race briefing. As I looked around I could see the cream of MSTC's finest.....Messrs Wintergold, Hoodless, Alden and others......as well as many (quite obvious) newbies. But I could also see many children including Ben Hoodless, Rob's 13 year old son, complete in his yellow and black tri-suit. My own daughter Harriet, 12, was less well kitted out but you could see in both of them an athletic posture and determination. 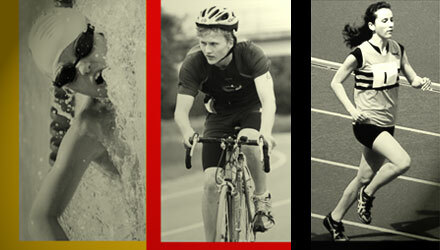 Both of them had entered the Horsted Individual Shortie, a 200m swim, 5k bike and 2.5k run. Call it a taster but there was definitely nothing stopping the two of them giving 100%. They both blasted off on the swim and you could tell both of them have been well taught (and practiced) in the pool. Ben went out strongly on the bike on roads he knows well, and chaperoned by Rachel Baker (no question of drafting of course). Then a quick transition on the village green into the two lap run with strong legs under blue skies. 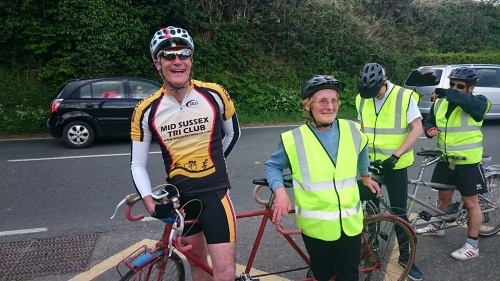 I was escorting Harriet on the bike and on the run. This was what the fun part of our sport is about......competitors of every age going as hard as they can, families gathered, laughter and cheers everywhere, mucking in with marshalling, having a pint afterwards. You don't expect your kids to like everything that you like.....but it feels good to see them getting stuck in and having some success. Both them gave it their all and came in strongly in each of the 3 disciplines. Ben is definitely one to watch in the future. He won the Men's Shorties event and took the Village Cup. Harriet was 2nd overall although the organisers awarded her the winner before taking it away 20 mins later! C'est la vie. More importantly both of them had a great time and I'm sure will be at other events next year. I suppose a trip to Evans might be in order for Harriet's Christmas present. I enjoyed all of it but if I had to choose it would be cycling.. Swimming , I'm not a great swimmer, but have improved a lot and can now go at a reasonable pace. The M check on my bike.. I learnt new techniques in my running which I will use in the future.. In the swimming especially about using your arms a lot more than your legs. Also the technique for running and when to change gears in cycling. Foods to avoid and to eat, transitions, running technique, how to swim a lot better. Just to say please pass on our thanks to all concerned for a fantastic tri summer camp. Elspeth and Harry both really enjoyed it and we were all impressed with the fantastic organisation. Thank you for all the hard work and preparation from the tri members. Please, please put it on again next year (and please start a junior/teenage section at Mid Sussex Tri Club)!! Nathan and I both wanted to say thank you to you and all at MSTC and everyone else involved in making the GoTri! weekend such a success. Nathan enjoyed the whole thing and we really appreciate the time and effort everyone put in. One parent was heard to say it was the best organized event they'd been too!!!..... Military precision!! !